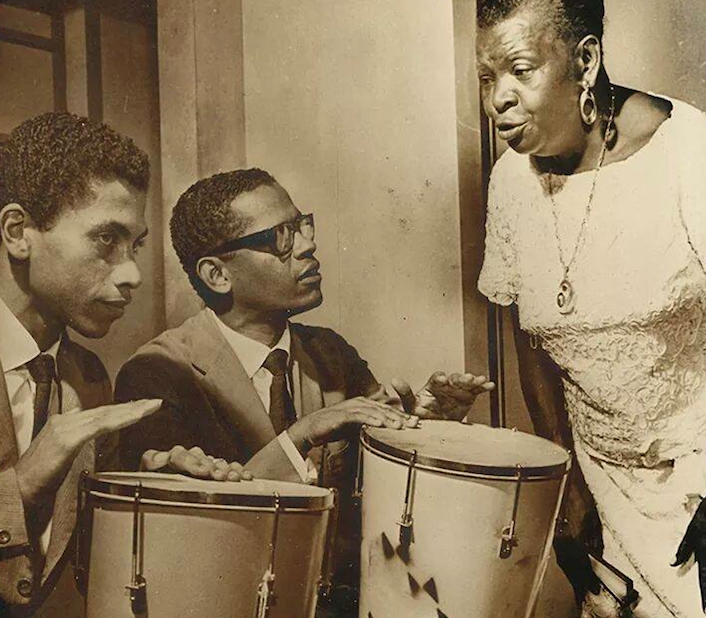 1966: Paulinho da Viola and Elton Medeiros practice with Clementina de Jesus for their show in Dakar, Senegal, at the first World Festival of Black Arts. Paulinho recalls he and Elton only played atabaque – no guitar or cavaquinho – and that the show was a huge success. Elton Medeiros (born 22 July 1930, Glória, Rio de Janeiro) has never been keen on playing the role people expect of him. He’s been known since the 1960s as a master of rhythm on the matchbox, for instance, but never liked posing with the diminutive instrument, saying those kinds of pictures and the like contributed to the “folklorization” of samba: “A lot of people think that to make samba you have to be a bar fly. I know how to beat a rhythm on a matchbox, but I don’t play up that role just to live up to what people expect of a sambista.” This song takes a similarly rebellious tone: Why do I have to pretend I have no cares in the world, and fool even myself, just because it’s Carnival? And it came at a time when a lot of sambistas were particularly down on Carnival, as Elton hints at in the introduction to the song on the 1977 album Os Quatro Grandes do Samba. The three samba schools he founded were: GRES Tupi de Brás de Pina [late 1940s], GRES Unidos de Lucas  and GRANES Quilombo , which was founded essentially out of protest of the direction samba schools had taken. In 1977, Elton indeed marched — or maybe danced is more appropriate — in Quilombo’s first Carnival parade. The sentiment expressed in this song reflects the widespread feeling of dejection that had taken hold among most “old-guard” samba composers by the mid to late 1970s: Most sambistas in Rio thought leadership at samba schools had become too autocratic and profit-driven, contributing to the commoditization of samba by seeking only sambas that would sell well. And any profits stayed in the pockets of outsiders who had taken power at the schools, or was used to pay for expensive artists to produce ever more extravagant Carnival floats and costumes. Paulinho da Viola in the first Quilombo Carnival parade. I wasn’t able to find images of Elton Medeiros in the parade. 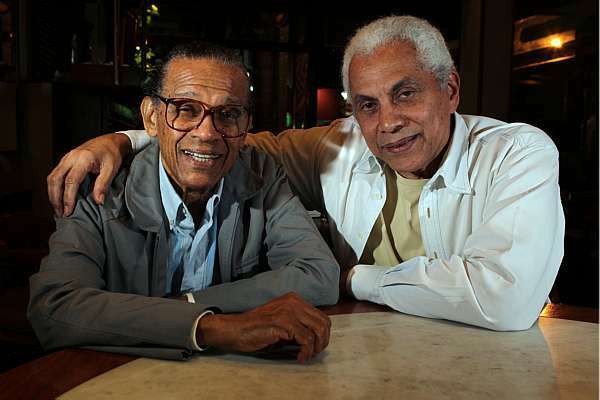 In protest — particularly of the situation at Portela — in 1975-1976, together with Candeia and Wilson Moreira (both Portela), and Nei Lopes (Salgueiro) — Elton Madeiros founded Grêmio Recreativo de Arte Negra e Samba Quilombo. Candeia had come up with the idea for the new samba school after growing totally fed up with Portela, as this post explains. Elton Medeiros was never a member of Rio’s biggest schools like Portela and Mangueira; in the 1970s he was a composer with GRES Unidos de Lucas. But Elton felt close to Portela because the school had chosen him and his line of composers at Unidos de Lucas to be their “patrons.” Medeiros also worked closely with several of Portela’s most revered composers, including Zé Kéti, Paulinho da Viola, and Candeia, along with Mangueirenses like Cartola — with whom he composed one of the best-loved samba classics of all time (and one of the first entries on this blog), “O Sol Nascerá (A Sorrir),” Nelson Cavaquinho, and Nelson Sargento. 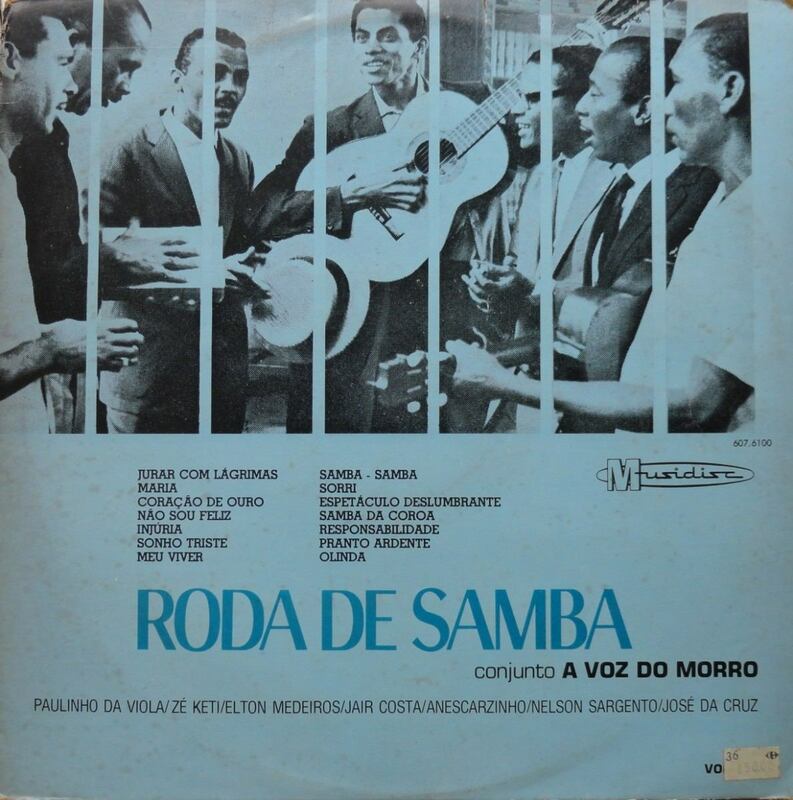 Conjunto Voz do Morro was one of the groups formed at Zicartola, in an effort to give more publicity to the greatest talents in samba do morro. L-R: Paulinho da Viola; Anescarzinho do Salgueiro; (??? 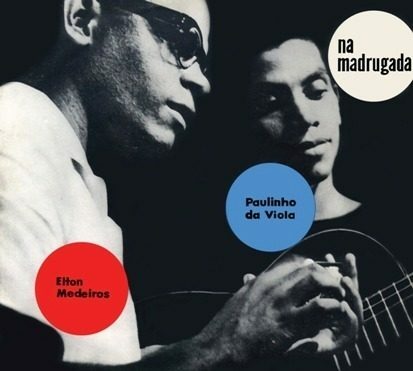 ); Zé Cruz do Chapéu de Palha; Elton Medeiros; Zé Keti; Jair do Cavaquinho. Medeiros was born in the Glória neighborhood of Rio de Janeiro, where he lived until the family moved to Brás de Pina when he was seven. Just a year later he reportedly began composing sambas with neighborhood friends, and as a teenager he learned to play trombone and saxophone at school. 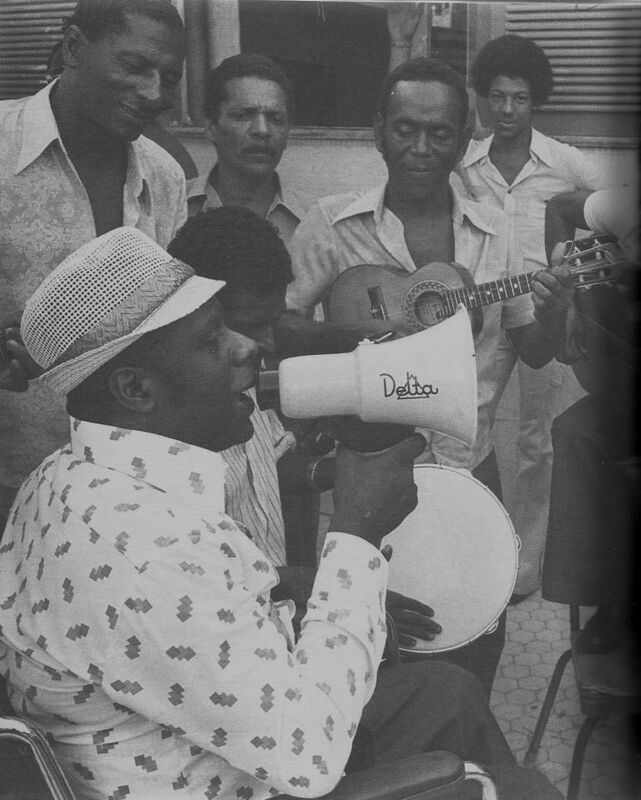 When he was about 20 he met Zé Kéti, and in the early 1960s he became a regular at Zicartola — the restaurant Cartola ran with his wife Zica from 1963 – 1965 — where he sang and “swapped ideas” (from the Portuguese trocar ideia) with Rio’s samba and cultural elite. Zicartola, with Nelson Cavaquinho on the guitar and Zé Kéti standing. Elton Medeiros with friend and partner Paulinho da Viola. Medeiros was a master of the matchbox but said he didn’t like posing with the “instrument” because he thought those kinds of pictures contributed to the folklorization of samba. 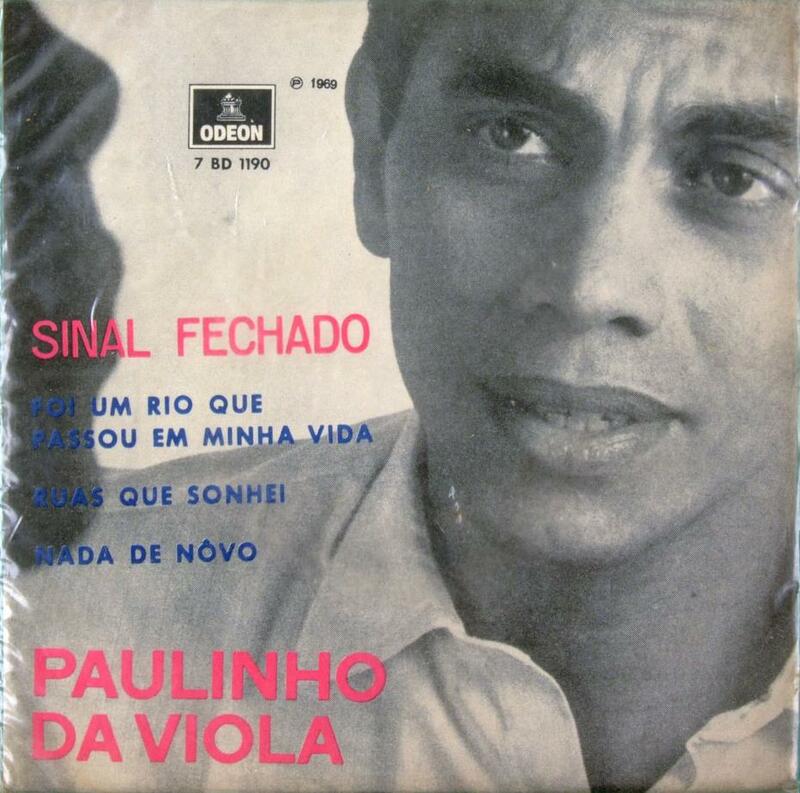 Paulinho da Viola saw the title “Por onde andou meu coração” (Where my heart has gone, roughly) and was inspired to compose this samba, which begins with musings about his heart having gone astray. 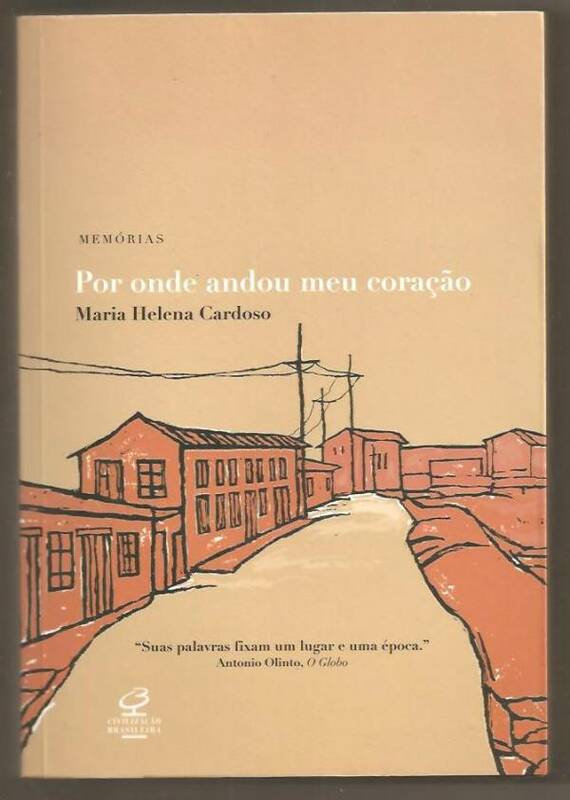 Walking down Rua México in downtown Rio one day in 1969, Paulinho da Viola looked in the window of a book shop and a title jumped out at him: “Por Onde Andou Meu Coração” (Where My Heart Has Gone, roughly). He liked something about the phrase, and it stuck in with him. Paulinho recalls that he initially wrote the samba with a different melody, which he explains and sings for what he says is the first time in this recent video of his show in Circo Voador. 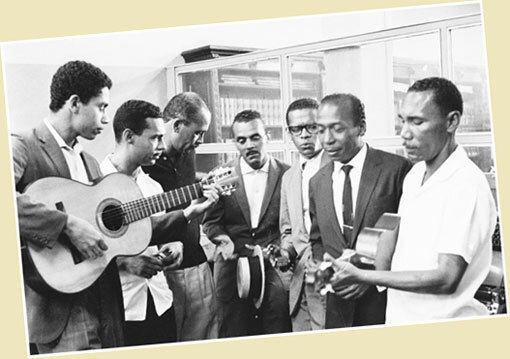 Paulinho da Viola started singing “la-iá, la-iá, la-iá la-iá” at the end of the song after hearing Jair Rodrigues’s recording, and he recalls Jair always joked that this meant he was Paulinho’s partner in the composition. Candeia singing with Martinho da Vila. Antônio Candeia Filho, known popularly as Candeia, lived a short and rough life: He died suddenly at age 43 after having spent the last 13 years of his life in a wheelchair. But just as the hardship of paralyzation made his music richer, his tragic early death makes his lyrics all the more poignant to listeners today. His moving poetic verses about life, race, social justice, love, samba and beer are some of Brazil’s most beloved, although — in part because of his short life — people often don’t know they were written by Candeia. Candeia was born on August 17, 1935, in the Oswaldo Cruz neighborhood of Rio de Janeiro. His father, Jairo, was a flautist, and from a very young age Candeia was surrounded by musicians. He learned to play guitar and cavaquinho and began to frequent the neighborhood samba school Portela. He played capoeira and participated in Candomblé rituals, developing an interest in Afro-Brazilian culture and social awareness that deepened later in his life. Candeia, Waldir 59, e Darcy in the “Ala dos Impossíveis.” Photo via Portela Archives. The run-in that left Candeia in a wheelchair happened on December 13, 1965. He left a party at Portela to bring a girl home (his wife, dona Leonilda, said the accident would never have happened if he’d brought her to the party instead of fooling around). Waldir 59 went with him — mostly because he was worried about Candeia leaving in such a drunken state. As they drove down the final stretch of Marquês de Sapucaí Avenue – the avenue that hosts Rio’s Carnival parades – nearing Av. Presidente Vargas, Candeia crashed into a fish truck. He pulled around, got out, and saw that his fender was bent; then he drew his gun and shot the truck’s tires. He threatened the men in the front of the truck, and as Waldir 59 recounts in the biography Candeia: Luz da Inspiração, the “Italian in the back of the truck” shot Candeia down. The five gunshot wounds left Candeia paralyzed from the waist down. His friend and biographer João Baptista remarked, “I think Candeia began to rethink some things after he was paralyzed,”and writes that the vast majority of his interviewees agreed that Candeia’s music became much stronger – both lyrically and socially – after the accident. Candeia was a fixture of Portela samba school, a close friend and partner of Waldir 59, Paulinho da Viola, and Monarco (who laments he only wrote one samba with Candeia, “Portela, uma familia reunida“). He began composing sambas at a very young age, and became while he became best known for his partido alto-style sambas — with improvised verses mixed in with a refrain — his samba-enredos were tremendously popular as well, and brought Portela six Carnival titles, in 1953 (“Seis datas magnas” composed with Altair Marinho, won perfect scores in all categories), 1955, 1956, 1957, 1959 and 1965, the latter five all composed with Waldir 59. 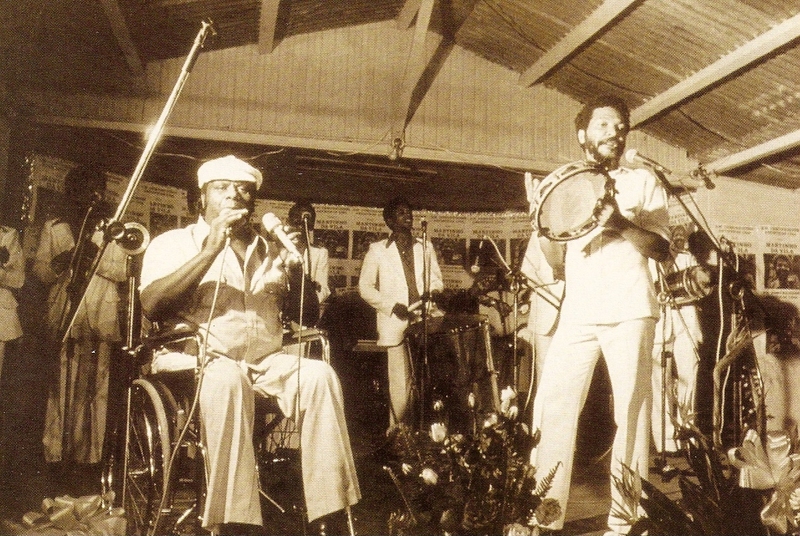 Candeia at Quilombo samba school, c. 1977. But in the 1970s Candeia grew fed-up with grave problems he identified within the school. 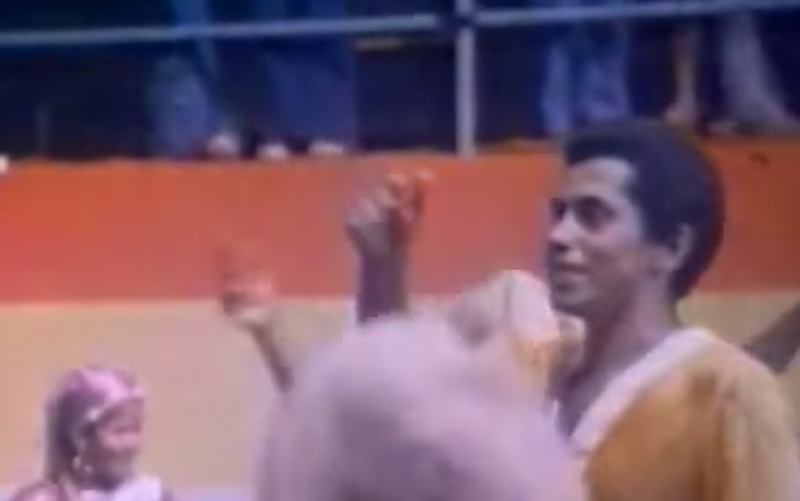 As Tantinho da Mangueira relates in this documentary clip, “people began to hang around the samba schools who had nothing to do with samba, as far as we were concerned.” Candeia felt samba was in danger of going from being a genuine popular manifestation to being a mere consumer product. He and other Portelenses wrote a letter to the president of Portela complaining that the leadership had grown too autocratic, and was pushing imitation rather than innovation — seeking to copy whatever was commercially popular at the time. Candeia offered suggestions for how to take Portela back down the right path, but felt his concerns were not heard. So he founded a new samba school and cultural center, Grêmio Recreativo de Arte Negra e Samba Quilombo (Quilombos were runaway slave settlements, as described in this post), inaugurated in January 1976 in Coelho Neto, Rio de Janeiro. In December of that year the school received a US$20,000 grant from the Inter-American Foundation in the United States to fabricate Carnival costumes, school uniforms and educational materials about Afro-Brazilian history and culture. 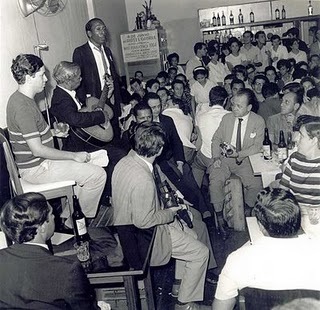 Almost every night Quilombo hosted debates and conferences about Afro-Brazilian contributions to Brazilian culture and national identity. And in Carnival 1977, with the participation of stars like Paulinho da Viola, Martinho da Vila, Xangô, Clementina de Jesús, and others, the school’s parade was a hit. Candeia’s untimely death from a heart attack on November 16, 1978, inspired a number of sambas in his honor, including “Silêncio de um bamba,” by his friends Wilson Moreira and Nei Lopes, and “O sonho não acabou,” by Luiz Carlos da Vila.